Give Sonequa Martin-Green all of the Emmys. Buckle up everybody, because “Perpetual Infinity” picks up the excitement right where “The Red Angel” left it last week. 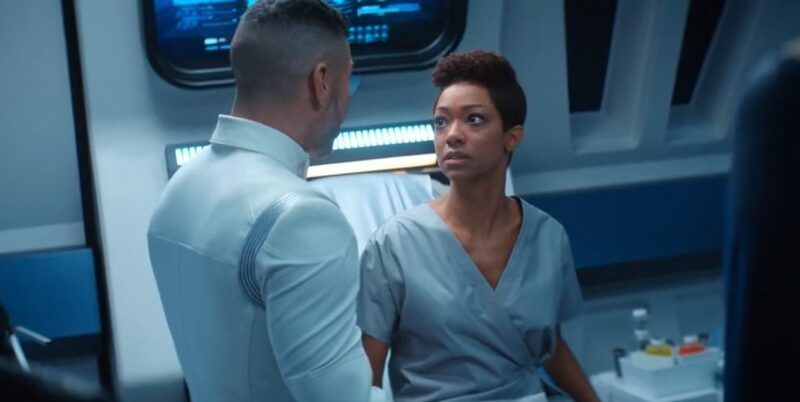 We got Michael Burnham experiencing an insane amount of emotion, giving Sonequa Martin-Green an opportunity to deliver what an Emmy-worthy performance. Leland, who got stabbed in the eyes last week, pays forward the stabbing to Ash Tyler this go around. Ash doesn’t seem real happy about it, to be honest. Georgiou gets a bit competitive for the maternal role in Michael’s life, but by the end of the episode? The cheese stands tragically alone. In the writing department? We got Alan McElroy coming back! 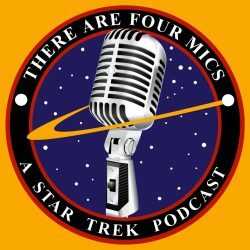 He was rocking the writing role just a few episodes back with “Obol for Charon,” which Joe and I continue to struggle with pronouncing. Other than that? He’s also written surprisingly unrelated things like Halloween 4, Spawn, and Michael vs. Jason. It’s tough to imagine a resume more divergent from Star Trek, and yet he helped deliver a quintessential Star Trek episode. Sonequa Martin-Green isn’t a guest star in Perpetual Infinity. But after the performance she delivered in this episode? She needs to have her name mentioned as much as possible when this episode comes up. Michelle Yeoh comes back as Philippa Georgiou, and gives hints that she might not be a terrible person! I mean, you do have to ignore all of the genocides she’s committed. And the fact that I am pretty sure she ate Mirror Saru just like ten episodes ago. But other than that. Ethan Peck as Spock continues to crush it. I had mixed feelings about Spock coming into Discovery this season because it kind of felt like they felt they needed a gimmick to get people interested. But hot damn. They’ve used him expertly, and he’s been nothing but a joy to watch. Alan Van Sprang makes another appearance as Leland. For a while? He seems to very clearly become something that isn’t Leland. I’m worried about his future on the show. Cuz it was just a couple episodes ago in “If Memory Serves” where he came close to displaying a conscience. Sonja Sohn, after being revealed as the Red Angel in last week’s episodes, finally gets to say some words! And as Dr. Gabrielle Burnham, she’s real good at words. I haven’t seen The Wire, but the fact that she’s on that show makes it all the more likely I’ll check it out. Because she. Is. Amazing. Kenric Green! He plays Michael Burnham’s dad, who according to IMDB, is actually named Mike Burnham. Fun fact? Kenric Green is married to Sonequa Martin-Green. Arista Arhin comes back as the Young Burnham, and apparently I just think she’s great. For a while, I was unsure if I just loved the glorious Vulcan hair cut. But nope. She’s rocking her own hair here, and she’s just as charming. If they do a Star Trek Discovery Muppet Babies edition, I will watch it if she’s the star.